Pinus sylvestris 'Watereri' are slow growing conifers with a dense form that lend themselves to being pruned into magnificent cloud trees. That is exactly what we have done using the Japanese technique of cloud pruning. Resembling perfectly formed fluffy clouds, these special trees make a wonderful architectural statement, yet also have a fluidity so suit many garden styles. The blue-green needles and cones add further interest. Pinus sylvestris 'Watereri' prefers full sun and is a hardy vareity of pine tree that can tolerate exposed and coastal positions. 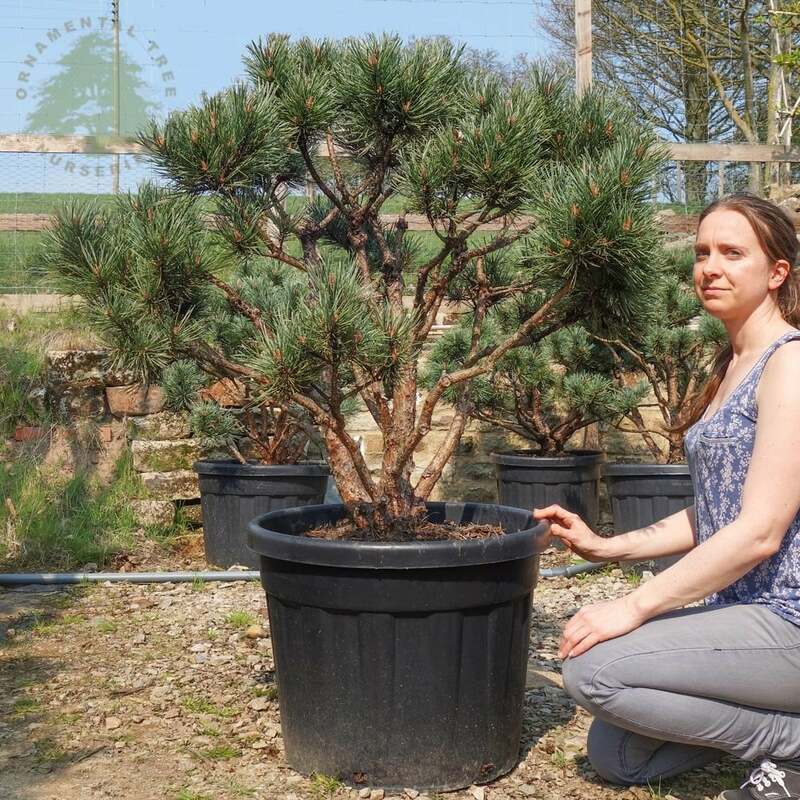 Our pot grown Scot's Pine cloud trees can be planted at any time of year. Prepare the site by removing weeds and grass within a metre of your desired planting hole, then dig a square hole as deep as your root mass and approximately 2x as wide. To help your tree establish more effectively, sprinkle root grow in the hole. Gently loosen the roots and place into the planting hole. Mix 50% of the original soil with 50% high quality compost, fill in the hole and firm around gently. Make sure not to bank the soil up around the collar of the tree as this can cause problems. If you’re planting Cloud trees in spring, summer or dry weather, water well and regularly for the first few months. Increase watering if there are extended periods of hot or dry weather. If you’re planting in autumn, you may only need to water a little. We also stock a range of irrigation kits, suitable for a variety of planting schemes.